The long range monsoon forecast predicted that total rainfall would be at around 95% of the long term average and would arrive on 5th June at the coast of Kerala. 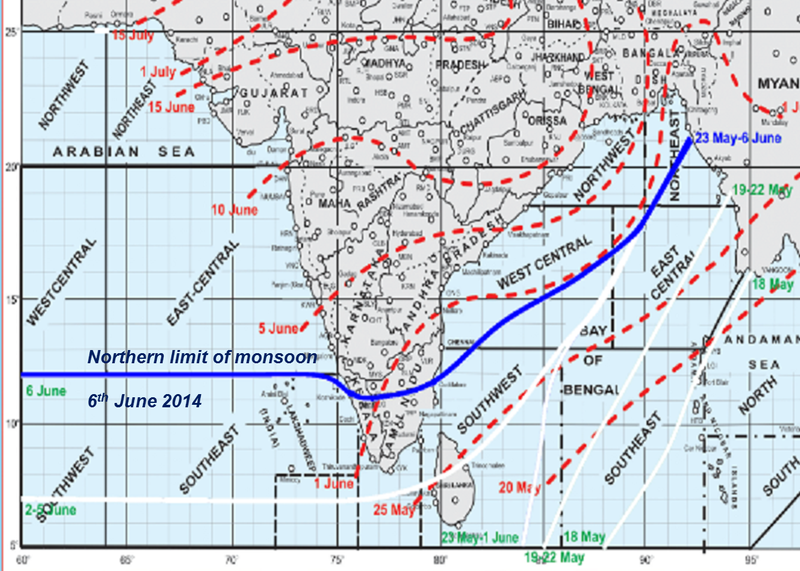 For a normal monsoon landfall in Kerala is on the 1st of June. One fear was – and still is – that if an El Niño develops this year, then a further shortfall of rain in the 4 months of the monsoon season might occur. It is still not clear if an El Niño will develop. But the monsoon which was stationary south of Sri Lanka a few days ago has developed rapidly in the last 24 hours and the northern limit has advanced well into southern India. The eastern end of the northern limit is still relatively static compared to the western end, but is expected to develop in the next 2 or 3 days. Southwest monsoon has set in over Kerala today, i.e. 6th June 2014. The southwest monsoon has further advanced into most parts of south Arabian sea and Kerala, remaining parts of Maldives-Comorin areas, some parts of Tamilnadu, most parts of southwest Bay of Bengal and some parts of westcentral Bay of Bengal. The northern limit of monsoon passes through 12.0°N/60.0°E, 12.0°N/70.0°E, 12.0°N/74.0°E, Kozhikode, Coimbatore, Cuddalore, 13.0°N/83.0°E, 16.0°N/87.0°E, 18.0°N/90.0°E and 21.0°N/92.0°E. Conditions are becoming favourable for further advance of Southwest Monsoon into remaining parts of south Arabian sea, some parts of central Arabian sea, remaining parts of Kerala, some parts of south Karnataka, some more parts of Tamilnadu and Bay of Bengal during next 2-3 days. Conditions continue to remain favourable for further advance of Southwest monsoon into some parts of northeastern state during next 48 hours. This entry was posted on June 6, 2014 at 2:46 pm and is filed under Climate, India. You can follow any responses to this entry through the RSS 2.0 feed. Both comments and pings are currently closed.